One of the things I love doing in my “free” time is to check out what real brides are upto these days. Well, some of you may say its not part of my work, but to be honest who really minds looking at gorgeousness all day long. Not me, for sure. On one of these casual browsing episodes, I came across some seriously drool-worthy gorgeous PreWedding Outfits that real brides wore and I couldn’t help but share here with you all. The saying holds true. Simple is beautiful, and in this case, its elegant and all kinds of dreamy. If you have a gorgeous bold coloured lehenga stashed in your wardrobe somewhere, you know exactly how to make use of it now. If you are looking like a beautiful flower, you might as well ask your groom to be to shower you more in it. I just love this shot captured by Dream Diaries. Its simple, and both the bride and groom to be actually look like they are having fun. That’s the point, right? I love how this brides outfit really pops in the backdrop chosen for the photoshoot. It brings the focus on her gorgeous goofy gown, and ohh, how much I am in love with this photoshoot. Aren’t you? 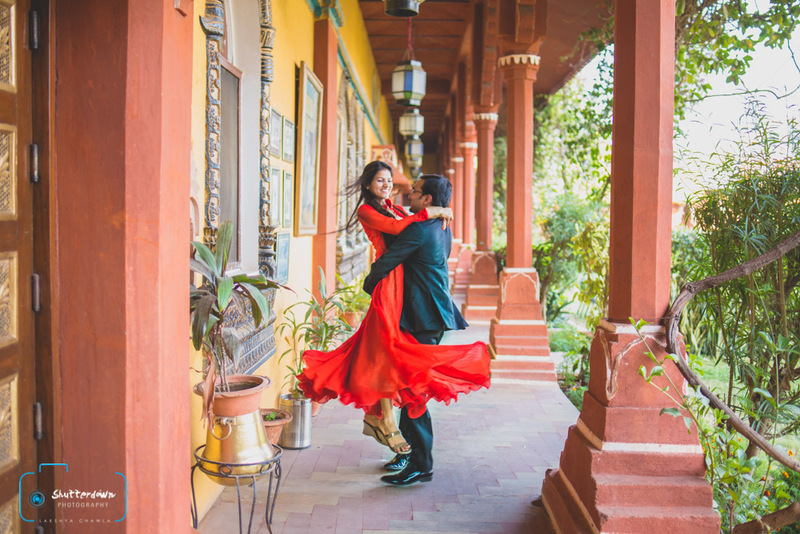 Red is the colour of love, and love is what radiates from these gorgeous pictures clicked by Wedding Nama. Isn’t that outfit just drop dead gorgeous? I have a thing for yellow these days. For me, its the colour of the season. It brightens up your day, and there is something about it that is instant love. You can just never go wrong with this pick. Have a gorgeous western evening gown? Then its the best option to go for in your prewedding outfit choice. If you are looking for a formal/semi-formal kind of PreWedding Photoshoot, this is a brilliant choice to go for. White flow gowns radiates pureness. Complete serenity, and the picture above shows just that. There is something so beautiful about this outfit in the purest form. This has been one of my favourite PreWedding Photoshoots in a long time. Its nothing out of the ordinary, but a simple skirt in that offbeat colour has just taken the ordinary pictures to becoming something truly extraordinary. Want a cinderella moment? Try these gorgeous goofy gowns. Gives total whimsical feels, doesn’t it. Your prince charming will fall in love all over again. # When in doubt, go for red ! If you have a bold red dress, don’t think about anything else. Just go for it. Red stands out in pictures like no other colour, and adds the perfect amount of drama to any picture. My personal favourite. Crop Top Skirts are in trend these days, and if you happen to have one in your closet, its a good time to make use of it.